Ben Slater is an ex-colleague from Accenture who, like me, left for greener pastures. Ben is the Chief Product Officer of Instaclustr, which provides managed solutions, enterprise support and consulting services for Apache Cassandra and Apache Spark. Instaclustr is one of the many successful start-ups coming out of Canberra. 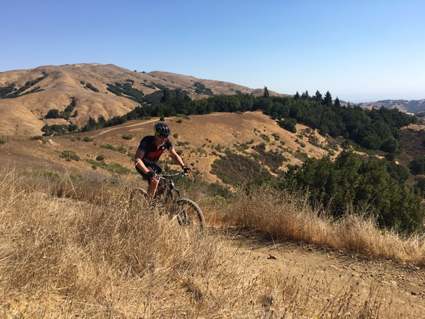 Ben kindly offered to write a blog of his time in San Francisco and how he managed to fit in some great riding while there on work. Last weekend I managed to sneak in a long weekend of recreation at the beginning of a work trip to San Francisco. Inspired by the CycleLifeHQ ethos of enjoying the world through cycling, I thought I’d pack my trip with cycling (and actually a little bit of sailing on Saturday but we’ll skip over that). I also needed to get some k’s in my legs in anticipation of the Kowalski Classic 100km mountain bike event coming up shortly after my return home. On Sunday, I planned to take myself for a long bike ride. A quick look on Strava Local showed several good rides around San Francisco. I chose the Alpine Dam/Mt Tam loop as one that looked scenic and matched the distance I wanted. I found one of the main local tourist bike companies also rented decent road bikes, so I booked myself at Trek Tarmac. Final preparation at home was loading the course file and San Francisco maps onto my Garmin for navigation. When I checked into my AirBnB on Friday night, it turned out my host was also a cyclist. He recommended Alpine Dam as the route to follow, so on Sunday morning I was looking forward to the ride. 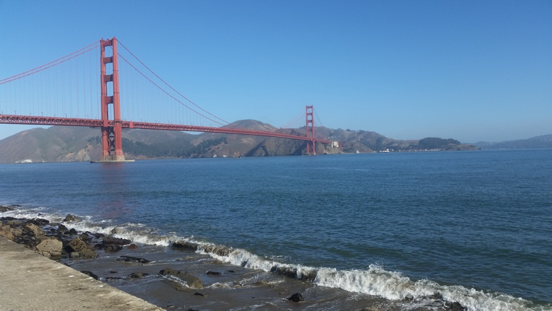 Picking up the bike and riding along the bay to the Golden Gate Bridge was pretty straightforward. It was clearly going to be perfect weather rather than the all too common San Francisco fog. 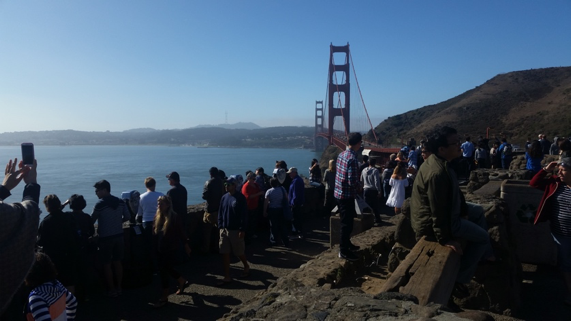 Riding across the Golden Gate Bridge was definitely an experience and the views and crowds something to see. It was here things started to get a bit interesting trying to follow the Garmin’s route. I was pretty sure I was trying to get to the town of Sausalito, but the Garmin and the official signs had different ideas about how to get there. I ended up riding a three-to-four km loop and getting back to the bridge again before realising the Garmin had gotten confused and started taking me home! However, once I figured that out and restarted the route following the Garmin’s instructions I got going pretty well. 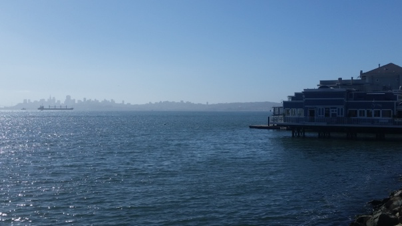 I rode through Sausalito with more great views across the bay to the city. Heading through Sausalito the route started to get a bit tricky resulting in a couple more wrong turns and minor detours. Around then I was overtaken by a rider who looked a similar pace to me. I rode up to him asked if he was riding the Alpine Dam loop, and if he would mind if I followed behind. That turned out to be the best move of the day. Not only was James a similar pace to me, but it turned out that he’d worked for the same multinational company as me and been a flat mate of someone I knew well! With James’ wheel to follow the ride became much more pleasurable. I was able to enjoy the experience rather than worrying about the next wrong turn. He also recommended a coffee shop where we stopped for a break before starting the climb to Alpine Dam. The climb to the Dam was long (5km, 300m) although with a few breaks and taking it at a steady rate, it was not too painful. One surprise along the way was that the road at the top was closed to cars due to a recent slip. This made for a very pleasant 10-15 minutes of no cars (and quite a few riders). By this time, things were getting pretty warm. The shade of the Redwood forest for the next section of the climb was a welcome relief. After the Redwoods there was a section of fairly sharp ups and downs across the ridge followed by a looong (by Aussie standards - 13km, 600m) descent. A stop for a final coffee in Sausalito and we were ready for the last short (but steep) climb to the bridge and across to San Francisco. By this stage the tourist traffic (including a million bikes) on and around the bridge was crazy. It was a dodge-em ride back to the city. The final section back to the bike hire shop was an unexpected highlight as following an experienced city rider through a big city was great fun for a boy from Canberra. Overall, a great days riding and awesome way to see the area. After around 100km and a decent climb, I was left a little worried how my legs would hold up for my planned mountain biking on Monday. Monday morning I caught an Uber from San Francisco out to the town of Fairfax to meet the guide I’d booked for the morning – Mark from Mountainbike SF. Fairfax was actually one of the towns I’d ridden through the day before so I’d get to explore the off-road side of the Marin County Hills. Mark met me right on the agreed time and unloaded a nice new Santa Cruz Bronson (nice!!). Things were looking good for a fun ride. After a little warm-up/skills coaching in the carpark, we headed toward the hills. As expected, there was a decent climb to get out of the valley. Mark was great to chat with to keep my mind off the hard work. Pretty soon we arrived at the top of the local flow track for a bit of downhill fun before continuing to the top of the hill. From the top Mark pointed out the original Repacker track, which was where mountain biking was invented in the 70s. Apparently, the event is so-named because after every run it was necessary to repack the grease in the coaster brakes of the vintage cruiser bikes that were used. The following tracks largely on private (scout camp) land had some great views and variety of vegetation from redwoods to shrubs to more desert-like scenery. 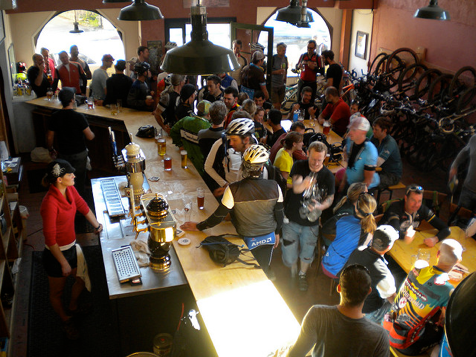 The final descent took us back to Fairfax where Mark directed us to the local bike bar, Gestalt Haus, for a hard-earned beer. Not quite knowing not to what expect from a bike bar I was amazed to find a pub with around bike racks in the main bar, around 30 bikes hanging on the racks and full of bike riders. Beer-drinking and bike-talking done, Mark dropped me back at the Sausalito ferry for a final bit of scenery on the ride home to San Francisco. My conclusion from my first bike tourism weekend? It’s a great way to explore a new area while enjoying the sport we love. Next time, I would study a planned road route a bit more carefully rather than entirely relying on my Garmin. Picking up a buddy on the road definitely made the day. Where are your favourite San Francisco rides? Let us know in the comments, or on the CycleLifeHQ Facebook page.